Going on Your First RV Vacation? Don’t Forget These RV Essentials! You’ve got your brand-new RV and you’re ready to hit the road. There are plenty of RV essentials that are obvious: clothes, camping gear and food. But there are some truly important pieces of RV equipment that a new RVer may not be aware of! Read on to learn about a few of the most helpful or critical RV essentials to pack for your RV vacation. If your RV doesn’t have hydraulic or electronic leveling, you may need to spend a lot of time looking for level ground to set up camp. The easier solution is to invest in some leveling blocks. 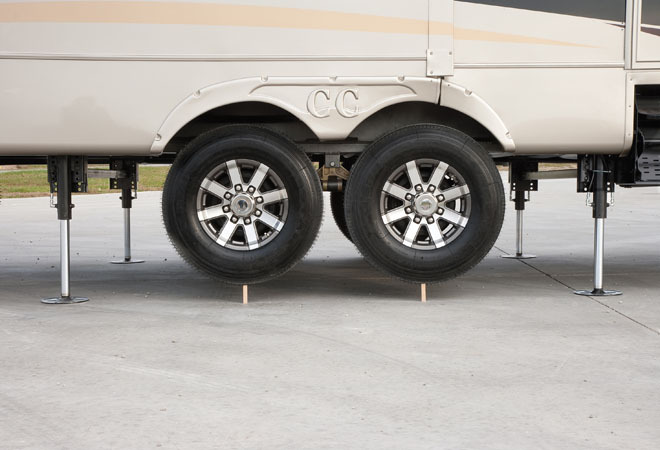 These easy-to-use blocks go down on the ground to let you level out your RV even on uneven ground. 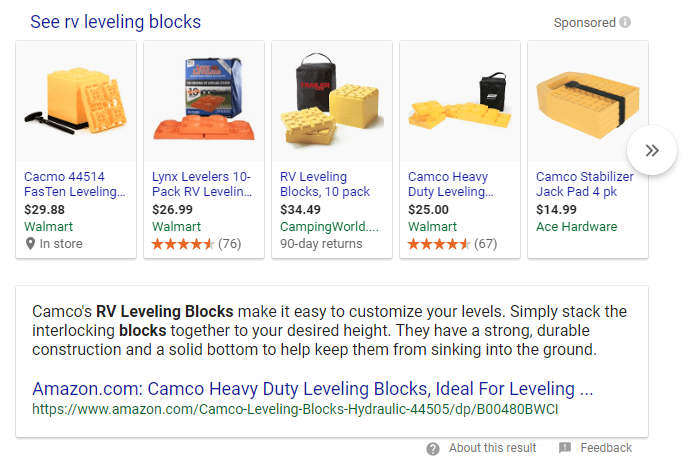 Shop for RV leveling blocks on Google. The best part? They stack on top of each other securely, so you can continue to add blocks until your RV is perfectly level. Leveling is a critical part of using your RV. The most obvious concern is your comfort. An unleveled RV is awkward to use and potentially unsafe. Imagine trying to live in a house that’s slanted a few degrees to the side – it would be a nightmare! Your RV may have leveling jacks. Your RV fridge also relies on the vehicle being properly level. If it’s not, your fridge may stop operating properly. In the short term, that’s bad news for your food storage. In the long term, it could mean costly damage to your fridge! If you’re even a little safety conscious, you probably have a fire extinguisher somewhere in your home. The same should apply to your RV! While RV fires aren’t common, they are a possibility. Car accidents happen, and sometimes appliances or electrical outlets have issues. You can’t always predict them, but you can be ready for them. A small fire extinguisher is all you need to bring with you on the road. They’re not expensive and they can be stored almost anywhere. If you just purchased a new RV, this should be at the top of your to-do list before you take a trip. Even if your RV is safe, camping often means campfires. It never hurts to have protection in case the wind picks up and the fire gets out of control! Don’t forget to read the instructions and show your family how it works. A fire extinguisher won’t help if you or your child can’t properly use it when the need arises. 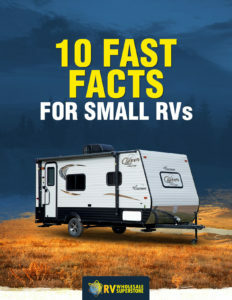 Check out the free infographic for small rvs. Electricity is a huge part of why many campers and travelers invest in an RV. 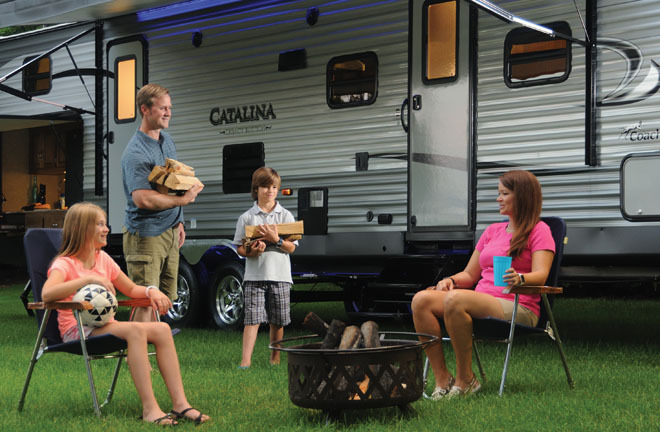 Many of the luxuries of an RV rely on being connected to a power supply, either at home or at the campsite. But just like home, the potential for a surge is ever-present! You never know how a campsite maintains their power hook-ups. Deteriorating wiring or an overload across the system could lead right back to your RV, costing you hundreds or thousands in damaged equipment. The best way to protect yourself is an RV surge protector. There are plenty of options for defending your vehicle and its appliances against a power spike. 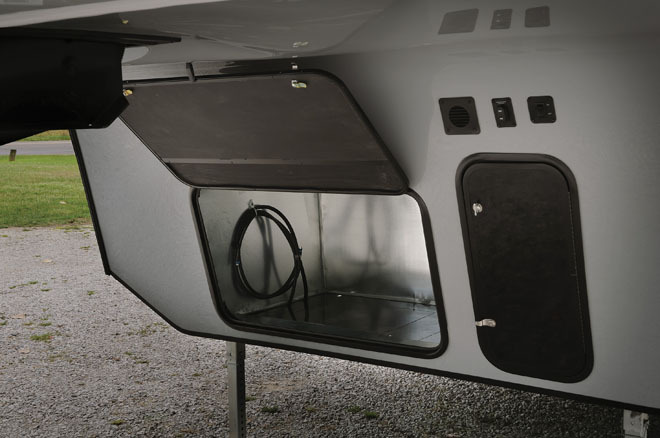 In-vehicle mounted protectors, adapters you plug in right at the source, or even an Electrical Monitoring System are all options to help defend your RV’s powered gadgets. The only way to you can go wrong with a surge protector for your RV is not to have one. Make sure to get one that works with your RV before you plug in! Just like electrical hook-ups, water hook-ups at a campground can be extremely varied. 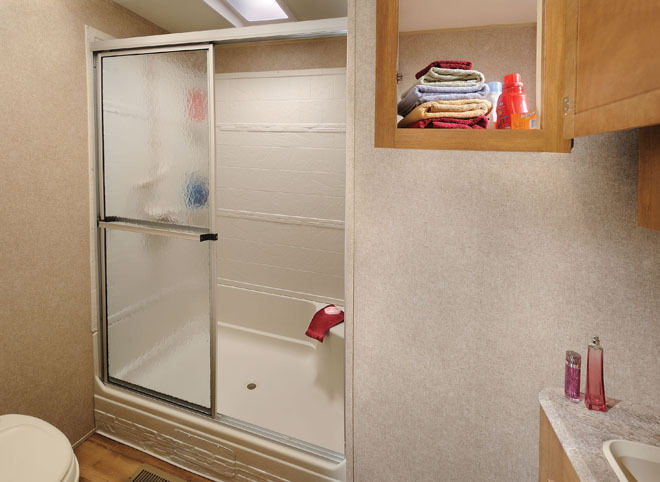 In addition to needing water every day to stay happy and healthy, your RV uses water for a variety of its amenities. But what happens if a campsite’s water is over-pressured? Make sure your showers are enjoyable; pack a water pressure regulator. Highly-pressurized water blasting your RV’s plumbing can do major damage. In short time, you could have a major plumbing disaster that’s wet and expensive to fix. A water pressure regulator prevents this from happening. They limit the PSI of incoming water hook-ups to protect your plumbing. Install a water pressure regulator to make sure that over-pressurized campsites can’t do any harm to your RV. These are great little devices, because they’re so helpful and they’re relatively inexpensive – usually under $10. Not every RV park will have 50-amp sites, whether they don’t offer them at all or they’re completely booked. Without an adapter, you’d be left to dry camp while staring at their 30-amp hook-ups. This adapter lets you get some power to your RV when circumstances don’t allow you to access a full 50-amp station. This Wolf Pack RV offers additional storage for cables and wires. Normal outlets, such as those in a home garage, aren’t typically designed for RVs. If you’re working on your RV at home and need to test the power, or if you’re stranded somewhere and only have access to normal plugs, this adapter can be a lifesaver! You’ll need to be careful about what you do with the electricity when you use an adapter like this, but it’s better than nothing. When you need it, you’ll be glad you bought one! Your refrigerator must be level, or it may stop working. Cooking on the road is a little different from cooking at home. 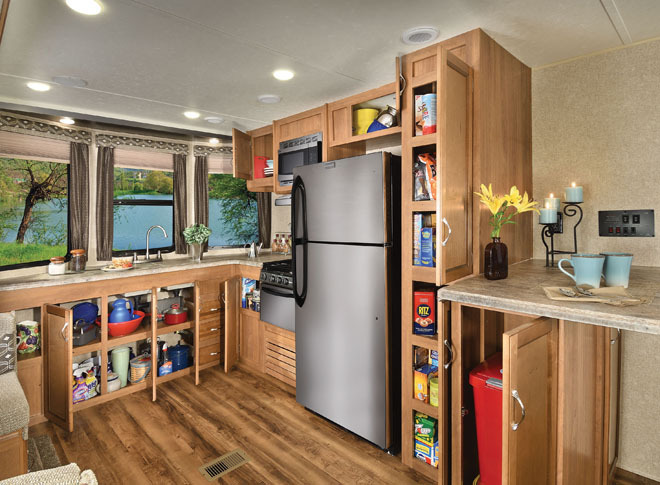 But even a small RV kitchen is well-equipped to handle most of your cooking needs. Not sure what your RV kitchen needs? Read our article about RV cooking and kitchen essentials for tips to be the world’s best traveling chef! Cooking in your RV starts with picking a travel trailer with the right galley and space for you. The professionals at RV Wholesale Superstore are ready to help you find the perfect RV for you and your family. Visit us in-person at 5080 W. Alexis Road, in Sylvania, OH or call us at (866) 640-9871.